It's all about Comfort & Luxury! 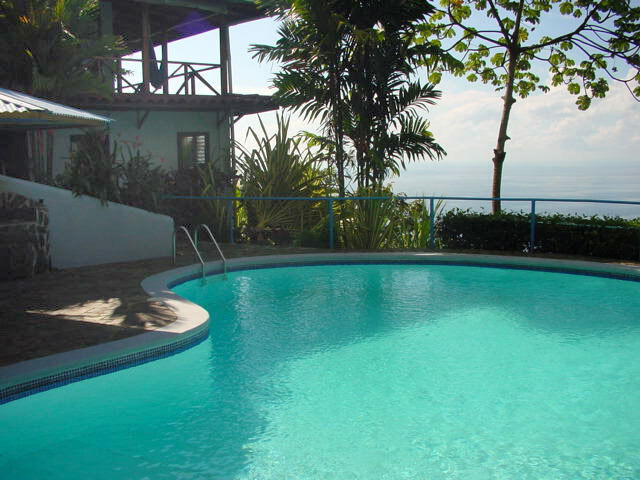 Relax and enjoy the spectacular panorama of ocean and rain forest jungle from the Villa Escaleras veranda, our stunning Costa Rica vacation home, located in the Escaleras Mountains, 1,200 feet above Costa Rica's rugged and beautiful Southern Pacific coast. Visit the photo gallery to see just how beautiful is the villa. 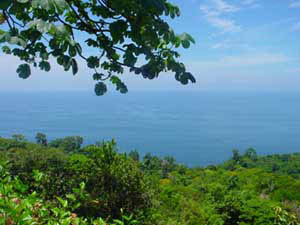 This unique region, accessible from the Costañera Sur, offers incredible scenery, abundant wildlife and a full range of recreational opportunities in a tranquil setting. Villa Escaleras offers a luxurious living experience, with its lovely large pool and veranda, nestled high in the Costa Rican jungle. Experience the most stunning sunsets imaginable, framed by the lush tropical vegetation of the rain forest that abuts the Pacific ocean. The Villa is tastefully furnished in the traditional Central American style, incorporating natural fabrics and Latin American art. The Villa is equipped with satellite TV, DVD player, ipod-accessible stereo CD and tape player telephone, high speed Internet access through a wireless network and full laundry facilities for guest use. Each of the four bedrooms of the Villa features a queen-sized bed. In addition, two couches can be converted to queen-sized beds, making the Villa able to accommodate up to 10 people comfortably. Nearby Casa Escaleras is available to raise the occupancy to 12. For reservations, please use our reservation form.